The book is all about villagers succumbing to the white man that has come to visit their village. 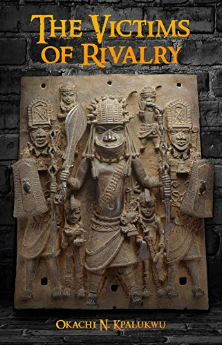 Going back in time, the story of Okachi N. Kpalukwu’s “The Victims of Rivalry” wraps around the victims of the Biafran/Nigerian Civil War as well as the surrounding colonial connection. While the war screamed “No victor. No vanquished.”, the book solely takes into consideration the people who were silenced and indeed vanquished during the dispute. The people of the village in the Ikwerre tribe of southern Nigeria struggle to get out of the colonial hold that surrounds them to once again gain independence. With their protective nature, they revolted when a white man came to visit their village, only to be calmed by their wise Chief. Slowly, they were able to trust the man and send their children to the new school that the white man erected. However, soon after progress had started and the school newly opened, a sudden civil war breaks out in Nigeria, putting their children’s education to a halt. With this, they realized that their effort to trust was all for naught. The book “The Victims of Rivalry” is set to be displayed in the upcoming 2019 LA Times Festival of Books on April 13–14, 2019.